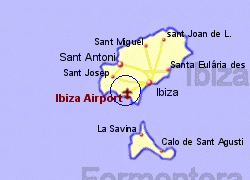 Ibiza Airport is located 7.5Km South East of the city, near the southern tip of the island. 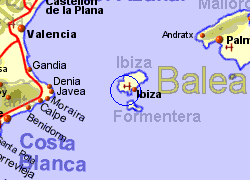 Bus to Ibiza city every 15 or 30 minutes during daytime approximately €2, and to San Antonio every 60 or 90 minutes. 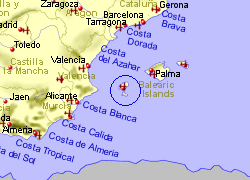 Taxis to Ibiza city approximately €16, San Antonio €28.